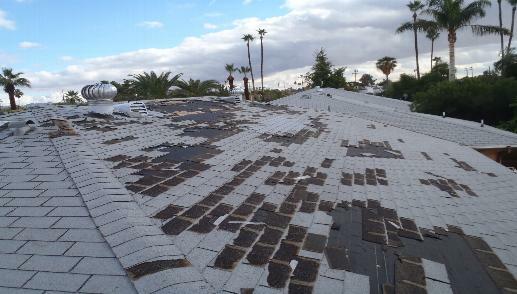 With the current rainstorms passing over Arizona and the Phoenix valley, many are discovering roof leaks they didn’t know they had. One of the biggest questions that people have is “Does my insurance cover this?”. The answer is yes, and no, depending upon the cause of the leak. Homeowners insurance is designed to cover sudden or accidental damage to your home, but does not generally cover damage caused by maintenance issues. Roof leaks can be and are caused by both, so knowing if a roof leak is a covered loss normally takes the inspection and review of both a contractor and the insurance company. The contractor can deduce the source and cause of the leak, while the insurance company interprets the coverage laid out in the policy to see which category the damage falls under. From there, a determination of coverage is made. The next question that arises is what is considered sudden or accidental damage. Sudden and Accidental Damage Generally speaking, sudden and accidental damages are caused by things outside of the homeowners control. The following is a small list of things to give you an idea of what sudden and accidental damages are. Now this list is by no means all inclusive, and your particular insurance policy may have specific exclusions for any number of the above listed items, which could deem them fully, partially, or not covered under the limits of your policy. Now we come to the other side of the coin, what are not considered sudden and accidental, and that may have limited or no coverage. Again, we’ve assembled a quick list for you. Remember that this is a general guideline, and not a hard and fast set of rules. Your specific policy may cover one or more of the following, or there may be mitigating circumstances that allow your claim to be partially or fully covered. Remember that a roof is designed to be a barrier between the interior of the home and the heat, cold, rain, and snow during normal weather events, and normal wear and tear is expected because of this. It is the homeowners responsibility to periodicaly inspect the condition of the roof and clean and maintain it. Damages that arise from a failure to do so may not be covered under your insurance policy. You may be covered under certain home warranties, home maintenance agreements, or material or workmanship warranties provided by the installer or manufacturer. During a rainstorm, it is hard to determine the actual cause of a leak right away and even more difficult to know if it will be a covered insurance claim. Many homeowners, especially in our current economic situation, don’t have the money to pay for a new roof if the repairs are not covered by their insurance. To further exasperate the situation, the water from the roof leak can damage the interior ceilings, walls, flooring and belongings of the homeowner if left unchecked and unattended. How can you protect your home from further damage, without immediately committing to thousands of dollars in roof repairs with no assurance of where the funds will come from? Many times, a simple tarp fastened down over the damaged area can slow or stop the immediate damage from continuing and allow you to schedule an inspection with your insurance company and a qualified contractor to pinpoint the source of the leak and determine coverage. This will also allow you time to receive competitive bids from multiple contractors prior to authorizing any repairs to make sure you are getting a consistent evaluation and a fair price. Depending upon the size of the area needing to be tarped, the initial cost of materials can range from around $40 for a small area covered with a single tarp, to around $200 or more for a large area with multiple tarps. This is the do-it-yourself cost. If you need to call in a contractor to perform the tarping for you, expect prices to start from around $300 and increase from there depending upon size and complexity. An average quality tarp up will normally weather the storm and last for a couple of weeks. A high quality tarp up can last several storms and several months, depending upon the materials used and the manner of installation. Do remember, though, that no matter how well a tarp is installed, if a severe weather event has the force to damage a roof, it has the force to damage a tarp. 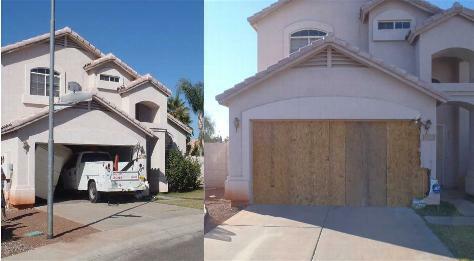 Doors and windows are damaged just as much, if not more often, than roofs. Not only can severe weather damage doors and windows, but criminals, such as vandals and burglars, may break a door down. Windows are often broken by errant baseballs, golfballs, and even rocks thrown from a lawnmower. With an average wait time of 3 to 5 days to replace a window or door, or up to 3 weeks or more for special orders, it is important to board up the opening to secure it against inclement weather, varmints, and opportunistic robbers. The following list is just some quick notes to keep in mind when attempting to tarp a roof yourself. If possible, avoid working on the roof during a rainstorm. NEVER work on the roof during a thunderstorm or during high winds. e attempting to climb onto the roof. Inspect it for any defects or damage before using, and please read up on proper ladder usage. Be aware and beware of power lines and trip hazards while on the roof. Always work with at least two people, this is for safety and efficiency. If you or your partner have an issue with heights, do not climb onto the roof. Long term water damage can rot away the subdeck of a roof and leave it weak. Walk cautiously on the roof and test out all areas before stepping on it with your full weight. Rotted subdecking can give way, and many a professional roofer has fallen through a roof and been seriously injured or worse. Ceramic and concrete tile roofs are very delicate, and break easily while being walked on. Take great care, and never walk on these types of roofs when wet, they are extremely slick. If possible, cut your battens on ground level. This reduces the chance of making cuts in a precarious position. Stage all the necessary tools and materials on the roof prior to starting, it is very tiring to constantly have to climb up and down a ladder. Call a professional contractor if you are not comfortable performing the tarp up yourself. The reason roof leaks are such a nuisance is because of the damage the water causes to the roof and the interior of the home. While minor water damage can be cleaned up and dried with minor inconvenience, major or prolonged water damage can cause serious issues and major repairs, including replacement of damaged drywall, insulation, flooring, and possibly mold remediation. 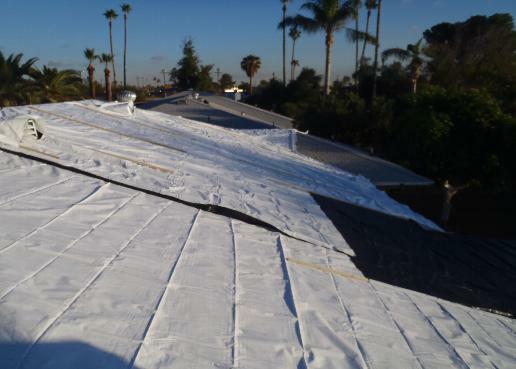 In order to minimize the damage caused by a roof leak, it is important to stop the source of intrusion (roof tarp), identify the water damaged areas, and begin cleanup and dryout procedures as necessary, and as soon as possible. Water continues to cause damage to building materials the longer it is allowed to dwell, and will spread out and affect a larger area as it seeks equilibrium. A professional water damage contractor can assist you in the cleanup, dryout, and repairs to your home or building. Familiarize yourself with your insurance policy, most policies have a clause stiplulating that the property owner is responsible for mitigating damages, regardless if the insurance company has reviewed the loss yet. This means your insurance company expects you to take proactive steps to stop the spread of damage, and some companies may not extend coverage to damage they believe could have been prevented. Talk to your agent or adjuster to find out what is expected from you. We hope you’ve found this blog useful and informative, and remember, it is not meant to be a rule book, but a guide to assist you. If you are unsure about the coverage your insurance policy extends, contact your insurance agent and they will be happy to go over it with you and explain what may or may not be covered. They may also be able to offer you additional insurance to fill any gaps in your coverage. If you find yourself in need of any tarp up, board up, water, fire or mold damage restoration, or any other type of property damage, please feel free to contact us and we will be happy to assist you.